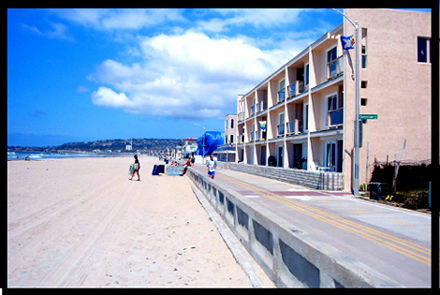 The Sunset Sands Ocean Front Vacation Rental provides San Diego area visitors with an enticing lodging option. For starters, travelers who choose to book this condo enjoy more privacy than they otherwise would at most hotels. The condo also offers more space and is better equipped than your average hotel room. Better yet, the Sunset Sands Ocean Front Vacation Rental is competitively priced, and it is hard to argue with the beachfront location. You can find the two-bedroom Sunset Sands Ocean Front Vacation Condo overlooking beautiful Mission Beach. Guests don’t have to walk but a few steps to get their feet in the sand, and after a full day of fun in the Southern California sun, they can fall asleep to the sounds of the surf just outside. Therein lies much of the allure, but the location perks certainly don’t end there. Just five minutes from the Sunset Sands Ocean Front is SeaWorld, and it is only about 20 minutes to downtown San Diego. Suffice it to say that many great attractions are within easy reach. Mission Beach is rarely overcrowded and has a very laid back atmosphere. Popular activities along this delightful strip of sand include surfing, boogie boarding, swimming, and sunbathing. Mission Beach visitors are also known to enjoy languid strolls along the sand, and there are opportunities to go fishing, boating, and parasailing. When a break from the beach is in order, Sunset Sands Ocean Front guests can retire to their condo and enjoy many of the comforts of home. A full kitchen, cable TV, a DVD player, and a stereo with a CD player are just some of the amenity highlights. Essentially everything that guests should need in order to enjoy a pleasant stay is available. The Sunset Sands Ocean Front Vacation Condo can be rented year round. A minimal stay of one week applies during the peak summer season. There is a two day minimum stay requirement the rest of the year. No pets are allowed.